Economic Prosperity Planning Initiative is Underway! 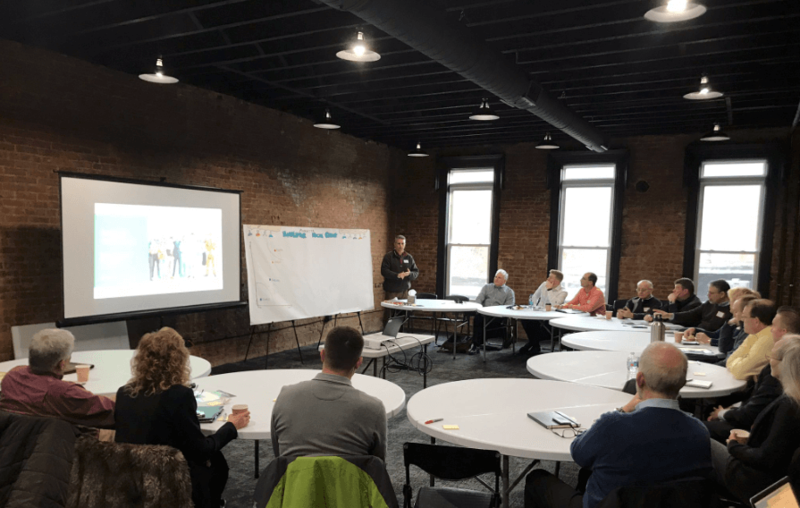 Nearly 160 business leaders throughout southern and eastern Ohio attended Business Focus Groups in nine locations in January and February, as part of our Prosperity Planning Initiative. Business Leaders convene in Marietta as part of APEG’s Prosperity Planning Initiative. The Appalachian Partnership for Economic Growth (APEG) and our parent organization, Appalachian Partnership, Inc. (API) kicked off a regional economic development strategic planning process, the Prosperity Plan, with Business Focus Groups in the eastern portion of the region in January. Meetings were held in Coshocton, Zanesville, Steubenville, St. Clairsville and Marietta. Two weeks later, a second round was held in four southern locations–Rio Grande, Athens, Portsmouth and Chillicothe. Consultant, Allison Larsen of TadZo, directed the meetings by providing context and combining individuals into small working groups, where they shared current strengths and challenges of doing business in southern and eastern Ohio. These meetings were the first of many steps in the development of a regional strategic plan. The second stage of this planning initiative gathered county economic development staff from across the region, local development offices and APEG staff for a Program Review Meeting to further discuss strengths and challenges of supporting economic development projects in the region. Efforts continue in March. For more information about how businesses can get involved, go here. APEG, a subsidiary of API, contracts with JobsOhio to provide economic development incentives, talent development services, site selection and site readiness services across 25 counties in southern and eastern Ohio. Since 2011, APEG and JobsOhio have awarded over $70 million in economic development grants, tax credits, and loans for 154 company expansions and new locations. Those companies have committed to create over 7,100 jobs in the region. API is a non-profit organization that provides a business voice for Appalachian Ohio and attracts resources to help businesses prosper. Since 2012, it has provided more than $12 million in free and low-cost business services, such as consulting services to the hardwood industry and grant funds that supported advanced training for 800+ manufacturing workers. API is currently launching a lending subsidiary to address credit gaps for area businesses.